Unlike Red Bull, street artist Colette Miller actually gives you wings. 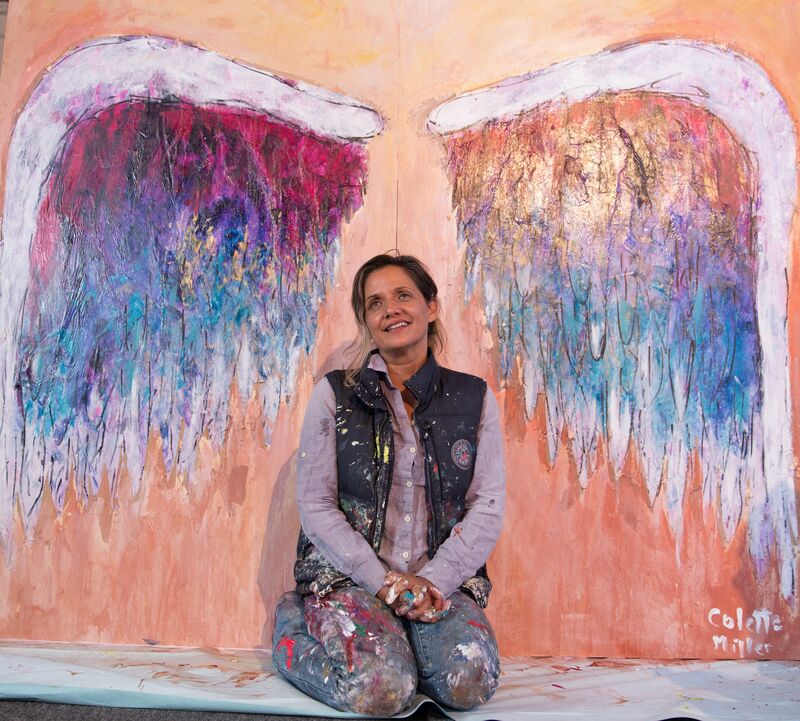 You can find her colorful, human-sized angel wings painted on walls throughout the city and worldwide, ever-ready for every walk of life to try them on. She is quite literally the wind beneath Los Angeles' wings. Since 2012, Colette has been painting these feathery eye-catchers in LA (the most famous dwells on the wall of St. Regis Liquors on 3rd Street) as part of what she calls The Global Angel Wings Project. Since then, her wings have taken flight become one of LA’s most sought after photo backdrops. And beyond LA, she has winged walls as far as Kenya, Cuba and Australia. Most recently, a pair of her Global Angel Wings has descended upon the art gallery at The Mission Inn Hotel & Spa—a cool, historic stay in Riverside where she’s holding a brief residency. In partnership with Riverside Art Museum (RAM), she’s teaching kids how to spread their own creative wings. Why was it important for you to do the residency at Mission Inn? Colette Miller: The Mission Inn Hotel & Spa is a Southern California treasure. It’s a pleasure to explore it and learn its history, especially since the original owner, Frank Miller, was an avid art collector too. I honestly just felt lucky when the opportunity was presented to me. What's your philosophy behind the wings? CM: That all of us have higher natures. They are interactive and most often in public spaces accessible to a lot of people—they are to remind humanity that we are The Angels of this Earth. It’s us. How many of your wings are in LA? CM: I’m not sure how many are in LA right now—maybe 25 or so. A couple are inside buildings and the Boxer Rescue of LA in Sun Valley just got two through the Save our Shelters TV show. Have any new ones in LA coming up? CM: I have a new pair at Los Angeles International Airport in the Tom Bradley International Terminal with Westfield (malls). Upcoming, I will be doing the Kidspace Children's Museum in Pasadena and I am talking to a few other people for LA installs and other painting exhibition projects. What’s your favorite pair of LA wings? CM: I like the ones at Arts District Co-op right now. There are two actually, side by side. They are so striking on a black backdrop and are very high and wide. Another favorite is the Car Tire wings I did with art from ashes or perhaps the Stained Glass Wings with Botart and Judson Stained Glass Studios. Tell us a story about one of your favorite reactions to your artwork? CM: It was with DTLA photographer Gary Leonard, in the very early days of the Global Angel Wings Project (2013). I was doing three in a row on Main Street and he came out to document them. He did an amazing series of photographs with the wings including three LA mayors—Garcetti, Villaraigosa and Riordan—and then his pristine collection was exhibited at the Cathedral of Our Lady of Angels last year and the archbishop blessed the exhibit, which was also extended a couple times. I felt so glad to be part of that and that politicians and even archbishops had participated and embraced legitimate LA street art in a way. His photo series is also on display in the Metro system. 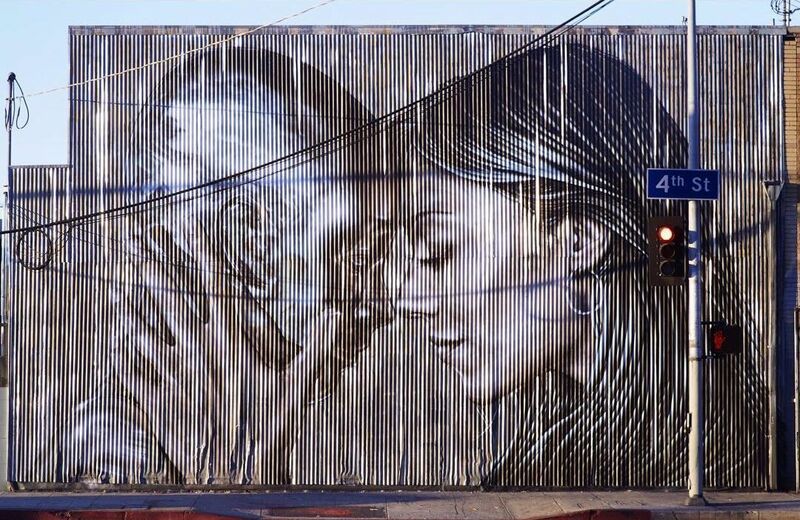 LA has a heavy presence of outdoor murals and street art and it’s something the city should embrace. CM: Well there is Jeff Soto mural at the Robert F. Kennedy Community School in K-Town (organized by Branded Arts); Robert Kennedy was assassinated when it was the Ambassador hotel. 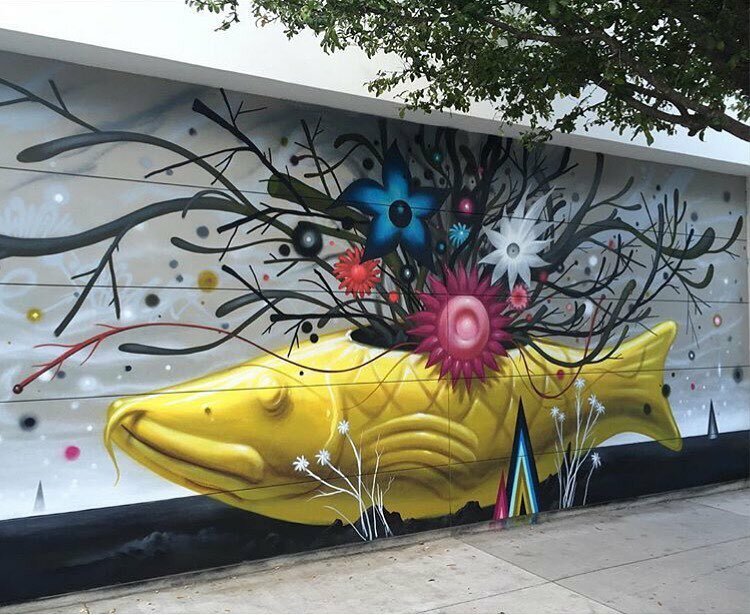 The mural is quirky and surreal with strange flowers and plants inside a ceramic yellow fish vase. CM: I like Shepard Fairey’s work. The one downtown is a lady called Peace Goddess. I like his clean graphics. He only uses three-or-so colors. It’s always a strong, confident mural that works well with the architecture. CM: I like Starfigher’s mystical type warrior females—kind of invoking of shamans to me. 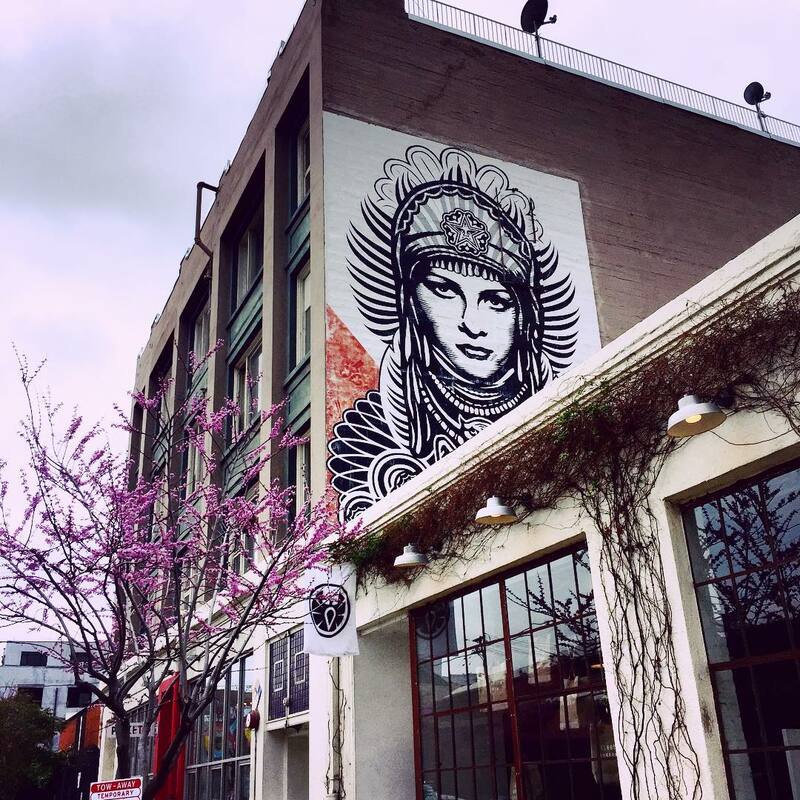 The one in DTLA by the 4th Street Bridge was once two females with antlers and headdresses—a collaboration with Fin Dac. It got tagged, but now she did a robot type lady with another female embracing. 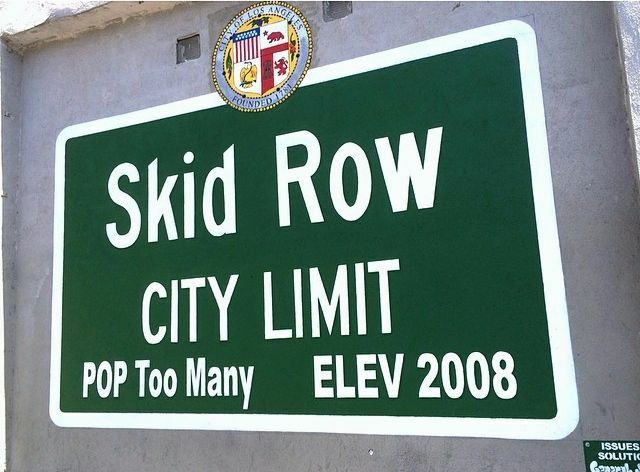 CM: SKID ROW city limit on Skid Row is a strong statement. Driving through there is a stark reminder of many things we face as a whole in humanity. It’s good for the soul to reflect and see this side of our society and help if you know how. CM: There is a Banksy on Broadway between Olympic and 9th street. 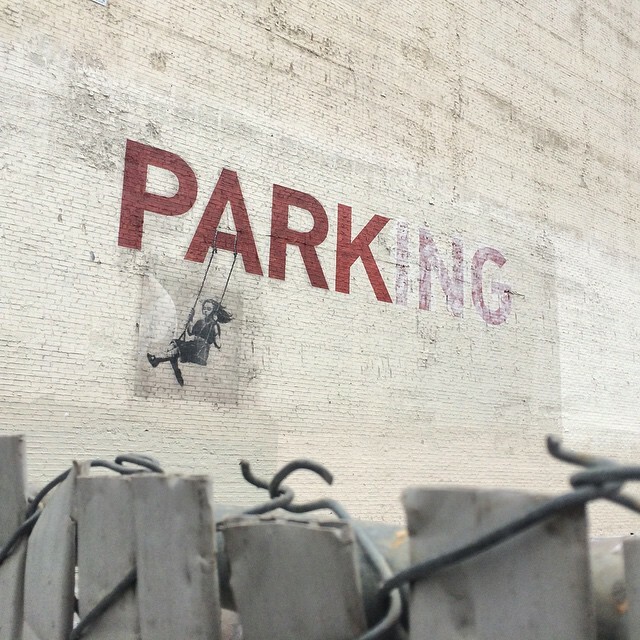 It’s of a stenciled little girl swinging on a swing dangling from the letters “PARKing” in which the “ING” is purposefully faded out. Lanee Lee is the co-founder of VoyageVixens.com, an award-winning, female-centric travel blog. She also is a food, drink and travel writer for mags like Nat Geo Traveler, Rachael Ray and Robb Report. Follow her on Instagram @laneelee. Liquor shop featuring spirits, wines of all varietals, craft beers, tobacco & sundries since 1984. Also known for The Global Angel Wings Project Wall. Ornate Spanish Mission-style hotel with a 5-story rotunda, plus a spa & 6 restaurants. This museum with an expansive outdoor play area features hands-on arts & science exhibits. Trendy market with live music events where contemporary vendors & artists sell their wares. Judson Studios is a fine arts studio specializing in stained glass located in the Highland Park section of northeast Los Angeles. The Robert F. Kennedy Community Schools, called the RFK Community Schools, is a complex of public schools in Los Angeles, California. The schools cost $578 million to build, making it the most expensive public school in the United States. On the corner of 3rd St. and Traction Ave., this mural in DTLA was done by Shepard Fairey.